By the Institution of Mechanical Engineers media team The Institution of Mechanical Engineers prides itself in having an excellent media profile. In the past our reports on subjects like sports engineering, population and Scottish energy policy have led the debate and helped establish the Institution as a go-to organisation for journalists writing about engineering subjects like transport, energy and biomedical engineering. While accustomed to the media spotlight, it is fair to say none of us had experienced the the full blown media storm we caused in January 2013. 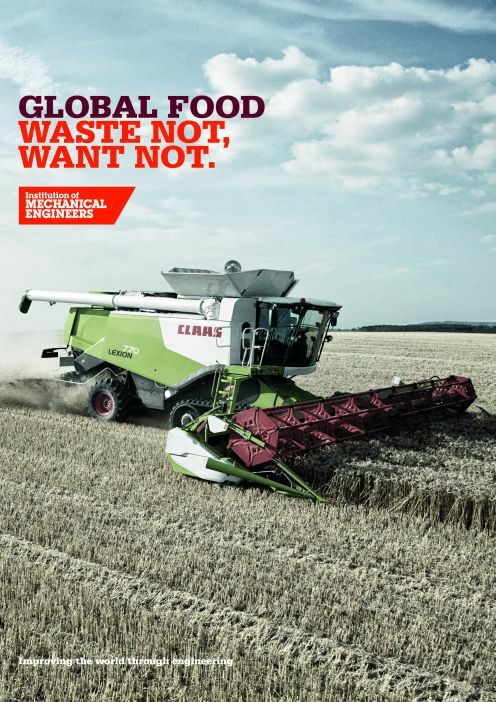 Before launching the Global Food: Waste Not, Want Not report, we knew we had a good story. According to the report as much as 50% of all food produced around the world never reaches a human stomach due to issues such as inadequate infrastructure and storage facilities through to overly strict sell-by dates, buy-one-get-one free offers and consumers demanding cosmetically perfect food. The statistics in the report were shocking, and it was the sort of story that after a decadent Christmas most people would be able to relate to. This report also challenges traditional perceptions of what engineering is about. Many people don’t realise the amount of engineering involved in producing food. It is engineers that develop fruit pickers; efficient ways to water crops; machinery used to make ready meals and the transport infrastructure needed to transport food. To kick-start the planning process for the report launch, we needed close collaboration between the communications department and our policy and marketing colleagues to ensure clear and interlinked messaging for each target group. Once the core messaging was refined and established, we felt confident that we had a strong basis for our press releases, letters to MPs, briefing documents for use during media interviews and private parliamentary briefings, as well as the messaging on our website and social media. In order to maximise the media and political opportunities, we decided to target specific messages to a wide range of consumer, economic and environmental media, many outside our usual sphere of influence. In addition to the planned PR activity, a number of politicians and NGOs were identified as potential advocates of the campaign and key messages were developed for social media distribution alongside a summarised landing page on the Institution’s website. With that all ready, the day before the launch we issued the embargoed press release. We sold different angles to the story to different journalists. For consumer affairs journalists, we focused on the waste caused by consumer and supermarket practices; for environmental and international journalists, we focused on the unnecessary waste of related resources, as well as the infrastructure issues faced by the developing world. The day before the launch, we answered a few follow up questions from national journalists, organised a couple of interviews with our key spokesman, Dr Tim Fox, and then held our breath for the next day to see what coverage the report had received. Except we couldn’t really hold our breath. The embargo for the release was set for midnight January 10 2013 and at 12.10am my mobile phone started ringing with journalists clambering to talk to Tim about the report and the Press Office phone still hasn’t totally stopped ringing. Within the first week of its launch, 27 articles had been published in the UK’s national newspapers, including front pages of the Daily Mail and Metro, and 129 TV and radio broadcasts on the report headlining BBC Breakfast, Radio 4’s Today, and BBC One’s lunchtime, 6pm and 10pm news programmes. Internationally, broadcast interviews were arranged with media as far afield as Australia, Canada, China and the USA, with over 1,700 printed and broadcast articles from over 80 countries recorded within the first month of publication. The report was downloaded 176,024 times, and trended on Twitter, generating comment from celebrities, like Dr Christian Jessen and Hugh Fearnley-Whittingstall, as well as organisations like Oxfam, WWF and Ben & Jerry’s. The astounding level of global media coverage helped generate invitations from the French, Mexican, Indian and Hong Kong governments to discuss the findings. In addition, the Institution’s President, Professor Isobel Pollock, was invited to speak at the United Nations in New York on engineering solutions to food waste in the developing world. Last Autumn we were thrilled to find out that our campaign had been shortlisted in two categories for the CorpComms Awards, and then in November we were over the moon to find out that we’d won Best Communications by a Not-For-Profit Organisation. A year later our campaign carries on and we continue to get calls from journalists and politicians wanting to speak to the Institution about food waste. There is also clearly much work still to be done as is illustrated by the fact that a poll we commissioned to mark the anniversary of the report showed that most people think supermarkets are still encouraging people to buy too much food.